Built in belgium since 1996. 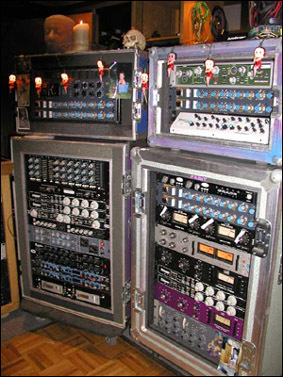 Andrew Phillpott = technician from Martin Gore. 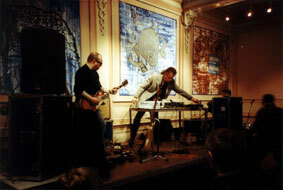 Pilot Picture : here you see Carl Craig performing at a design University, with Harry Bertoia artwork, using the Sherman Filterbank 2. Sherman demonstrates his new Sherman Quad Modular Filter to Tom Rowlands (Chemical Brothers). 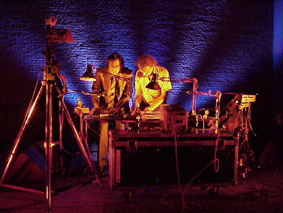 Here you see a picture of Pat Mastelloto, drummer of King Crimson (& David Sylvian), with the Sherman Filterbank using live on drums. Spot it at his right side. 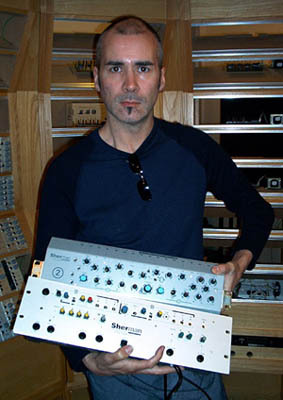 PHILIP Oakey, from HUMAN LEAGUE, showing his 2 Sherman Filterbanks: below the PROTOTYPE (only 40 were made in '95) and above the more recent FILTERBANK 2. POPVERDORIE Workshop Leuven, April 15th 2000 Jean-Marie Aerts & Herman Gillis.